Consume less or consume more? To save the world from climate catastrophe we need a recession because we have to cut consumption that pollutes. We need a “green recession“. given the insatiable and irresponsible growth produced over many decades, we need also to think of containing growth by setting some reasonable limits and even re- tracing our steps before it is too late. “re- tracing our steps before it is too late” means reverting to previous less polluting lifestyles and reducing consumption. 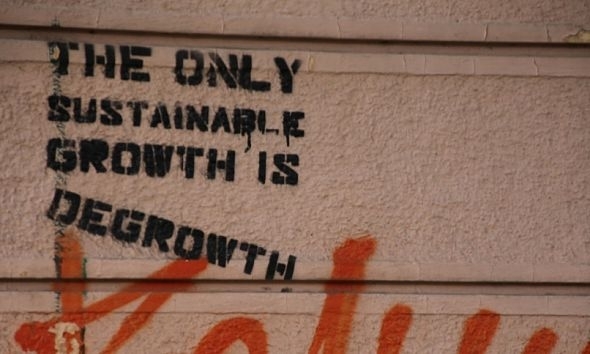 Less consumption would mean a recession. [To end extreme poverty] will require sustaining high rates of economic growth across the developing world, as well as translating growth more effectively into poverty reduction in each developing country. Climate change is a fundamental threat to development in our lifetime. If we do not confront climate change, we will not end poverty… The good news is that climate action does not require economic sacrifice. Smart policy choices can deliver economic, health and climate benefits. “Green Growth is a Fantasy”: Dangerous climate change cannot be avoided without reducing world consumption. The World Bank should do a similar analysis. They will be surprised. Will the polluters refuse to pay? One of the strongest criticisms of the World Bank has been the way in which it is governed… it is run by a small number of economically powerful countries…which also provide most of the institution’s funding. In saying that “climate action does not require economic sacrifice” the World Bank implies that no nations need reduce consumption. This includes the biggest polluters that are the “small number of economically powerful countries” controlling the World Bank. The Bank may be being pragmatic: the big polluters are likely to refuse to accept limits to their consumption – and they pay the Bank’s bills. However, a small proportion of the world’s population cause the majority of the greenhouse emission. Kevin Anderson’ points this out in an impressive interview Climate targets ‘impossible’ unless rich cut emissions 10%. These are likely to refuse to pay their dues for their pollution. Can extreme poverty be ended? The “small number of economically powerful countries” controlling the World Bank are the rich to whom the fantasy of green growth appeals most. They can pretend to reduce poverty while continuing to pollute – but it is a pretence. This discussion may be hopeless but it is interesting to ask the question, “As green growth is now impossible how can we end extreme poverty and also avoid dangerous climate change”? One possible scheme to avoid dangerous climate change is this: Levy a high tax on carbon emissions and share the proceeds equally. To avoid dangerous climate change, the tax will need to be high enough to substantially reduce carbon emissionsn. Howevver, this will cause a fall in production and consumption. Compared to the poor, the rich and affluent cause more carbon emissions simply because they consume more. Their share of the proceeds would not cover their increased taxes. For the poor, who have lower emissions there would be a net gain. Ther is therefore a redistribution from the rich and affluent to the poor. The post World Wide Carbon Fee and Dividend describes such a scheme. It is not Green Growth but it is Green Redistribution. Corollary: The benefits debate – labour is not the only source of value. Green redistribution accepts that consumption must fall. It must fall the most in the countries that have the most affluent and polluting citizens. If consumption falls, so must production but unless jobs are cut, most people have to produce less. Productivity must fall but with Green Redistribution, the poor would have their incomes supported by the proceeds of fines on pollution. This support could change the nature of the benefits debate. Given the size of the redistribution – driven by the need to save the climate – the poor would receive payment large enough save them from poverty. It would be a welcome recognition that labour is not the only source of value. This is the opposite to the beliefs of most politicians in the UK and wider. Most want to increase productivity and GDP so that workers can be paid more for their labour without relying on benefits or employment subsidies. This is a recipe for climate disaster.